Estimating is what you do when you do not know. 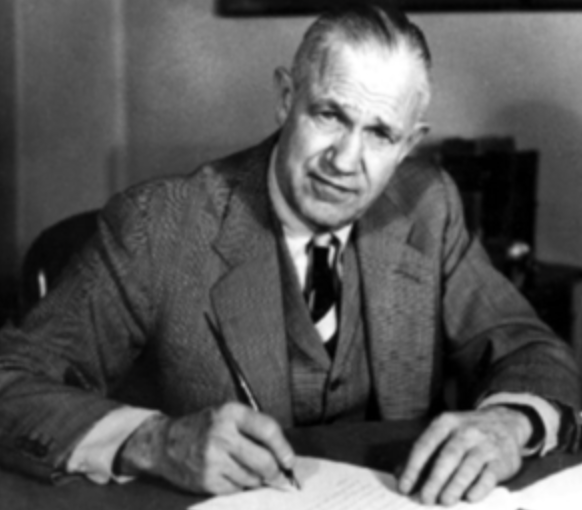 Most in money management have never heard of Sherman Kent. He is a legend within the intelligence community as the person who shaped thinking of intelligence analysis, the methodical examination of information to make risk assessments, for the CIA. Kent worked for years at developing the CIA's capability to make effective intelligence analysis. His thinking could easily be applied to investment analysis. What is surprising is the poor use of language with investment analysis. Research reports are written with words that may not have a deep level of precision. Hence, we can have readers come away with different expectations from the same report. This poor level of precision can be even worse with the spoken word. Think of the investment committee meeting where everyone gives their opinion on the direction of rates or the stocks market. Members will use words like "probable," "likely", or "going to happen", but there is little agreement or clarity on what are the probabilities with these words. Opinions are given but they may not be enlightening because here is no precision in the forecasts. Kent focused on clear recision in analysis. The analysis may not always be correct. These are estimates or forecasts with uncertainty, but there has to be clarity on what is being said and how it is presented. Kent's piece Words of Estimative Probability is a classic on how precision could be used with language. It was not fully implemented; nevertheless, it provides a framework for better precision in language. It weds the measurable with the verbal. Below is the matrix he developed to match probabilities with words and a matrix of similar words that can be used for different levels of probability. I would not go as far as what Kent is suggesting for analysis, but it certainly is worth a discussion to see how any qualitative judgment can be made more precise. Quantitative analysts should be forced to provide precision in forecasts and a similar standard should be applied for those using qualitative language. Have the QE policies of the Fed worked? Many have just talked about the success of the Fed' policies through the counterfactual. "Boy, the world would have been a lot worse if it did not engage in the unconventional policies like QE1, QE2, and QE3." Those on the opposite side of the spectrum argue that these policies have caused excessive risk-taking because firms have reached for yield. Unfortunately, for either of these arguments, there has not been a lot of empirical evidence to provide an answer. We now have some new evidence which is very insightful. Garbiel Chodorow-Reich has presented "Effects of Unconventional Monetary Policy on Financial Institutions" in the latest Brooking Papers on Economic Activity.This may not be the definitive work on the subject, but it provides some useful analysis on the how Fed policy impacted financial firms and whether these firms changed their behavior in a zero rate environment. The unconventional monetary policies had a strong positive impact in the 2008-2009 winter period for both banks and life insurance companies through creating an asset market environment that was repriced at higher levels. The legacy assets that were floundering from declines in 2007-08 were lifted higher which supported the balance sheet of these firms. This view is consistent with what everyone will say about the flood of liquidity after the September 2008 crisis period. The Fed acted like a good lender of last resort and saved the financial system through the actions of unconventional policies and TARP. However, the impact of expansionary policy in 2010-013 was more mixed. There was not a negative effect but the sizable positive impact seen in the winter of 2008-09 was diminished. The author looked at whether fund managers reached for yield during the post crisis period. The was clear evidence that this was true for money market funds which had high cost structures. They needed to offset their higher fees and costs when rates moved to zero. Private defined benefit funds also increased their risk taking in 2009, but this behavior was largely dissipated by 2012. The author concludes that there may have ben more risk-taking in the initial period after the crisis but this riskier behavior was not seen later in the analysis. This is consistent with the idea that there has been a smaller impact from monetary policy as we have moved further from the crisis. I found this work very useful for helping me think about risk-taking behavior by financial institutions and the evidence presented was compelling. I am convinced that the impact of unconventional monetary policy has dissipated, but I still believe that the zero rate environment has changed risk-taking behavior for both consumer and businesses. Savers are changing their work behavior and retirement plans. Financial institutions have had to change their activity mix to make up for the fact that their loan spreads may be lower and they are stuck with excess deposits. Incentives matter and change behavior. If you change the time value of money, behavior will change. We just have to get a better handle on the measurement. Keeping rates low and stable for such a long time will change behavior, we just do not know exactly how. 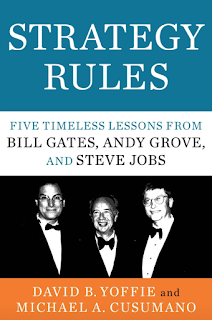 I took some time out from reviewing investment research to read Strategy Rules - Five Timeless Lessons from Bill Gates, Andy Grove, and Steve Jobs by David Yoffie and Michael Cusumano. Gates, Grove, and Jobs do not seem to have much in common other than being in the technology areas and being wildly successful; however, I was intrigued by the possible link between these three. The authors suggest that they all followed five similar lessons. I actually found the lessons as useful for thinking about money management and hedge fund firms. These are some very useful business strategies for the development a fund. 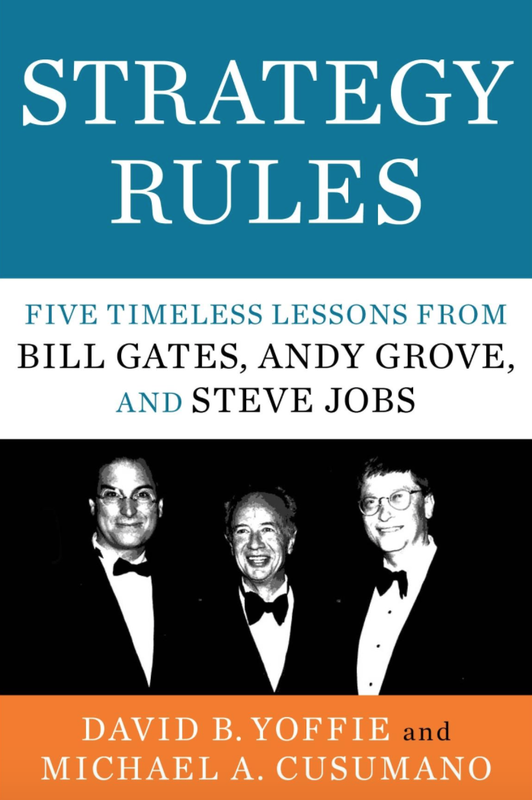 The five lessons are in bold with how I think about them for the development of a money management firm. • Look Forward, Reason Back - Think about the goal and then what you need to do to achieve it. If you want to make a certain return above a benchmark, then work back and see what are the sized bets that have to be taken and what are the returns necessary for each of your active bets. If you want to grow assets, think about the size of the firm and what is necessary to get to that goal. • Make Big Bets, Without Betting the Company - This is classic risk management. If you want to make sizable returns, you have to take big bets, but you cannot bet the ranch on any one of these trades. • Build Platforms and Ecosystems—Not Just Products - This is very insightful for money management firms. Managers should not think about funds but the platform for return generation.The process is more important than the product. If you are delivering returns to clients, what is the delivery system for those returns. • Exploit Leverage and Power—Play Judo and Sumo - If you are small, then exploit your size and be nimble. if you are large, use you power to gain scale and depth. Leverage the technology and skill you have against competitors who may not be able to adjust portfolios quickly. • Shape the Organization around Your Personal Anchor - Some managers are better value guys. Others are better quants. Us the skills you have to create the firm strategy that is consistent with who you are. The strategy for how the hedge fund is structured is as important as the trading that is conducted. The firm has to have a clear strategic identity. 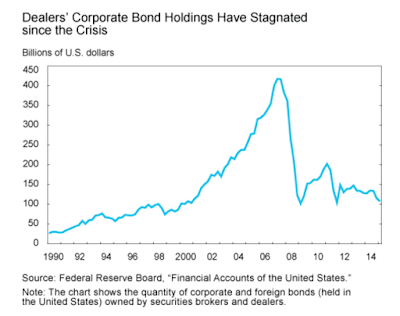 Corporate bond liquidity - should we be worried? The New York Fed economic blog has written an informative series on corporate bonds liquidity. 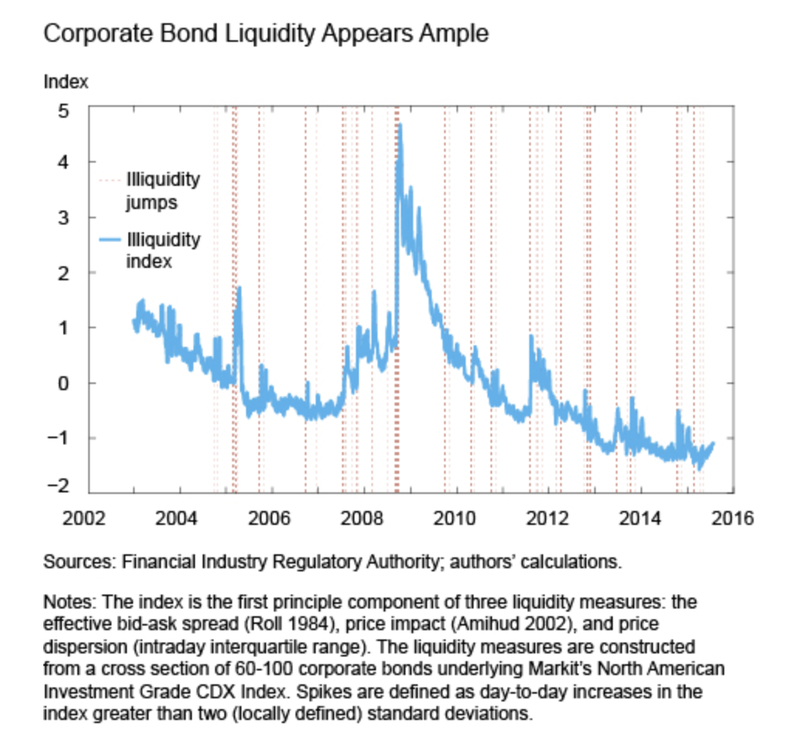 It shows that by some simple measures liquidity has returned or improved relative to pre-Crisis levels; nevertheless, we think there are significant changes in corporate bond trading that have not been fully realized or fully discussed by the New York Fed. 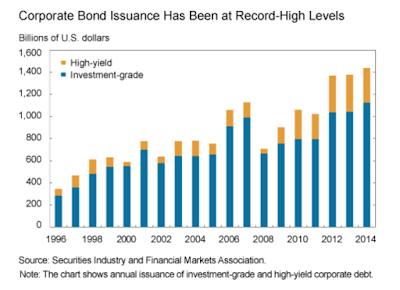 The ways of doing business in corporate bond trading have significantly changed over the last few years. Their research work does not fully address these structural changes which is impacting the way investors trade in corporates. Although liquidity does not seem to be a problem in corporate trading, we still are in a period of strong demand for bonds as the reach for yield continues. We will have to see what liquidity looks like when there is a change in longer-term asset class demand. The current concern about liquidity in corporates is simple. Dealers have been holding less in inventory, yet there has been a significant increase in the amount of bonds being issued. There has not been a significant amount of global deleveraging so the debt outstanding is still high. Most expectations would say that the cost of immediacy when there is less dealer inventory should be impaired. If that is not the case, the cost of search for finding liquidity has to have gone down or dealers have gotten much better at their jobs. Trading volume in corporate bonds has increased about 50% since the crisis, and is about 25% higher than the pre-crisis trading volumes. More trading is going on given the increase in the new supply. The composition of trading has also changed. The average trade size is down 25% but the number of trades have almost doubled, so the volume increase is coming from more smaller transactions. The bid-ask spreads have fallen to their lowest levels, but that might be expected if the risk of trading any bond is lower since the trade is smaller. 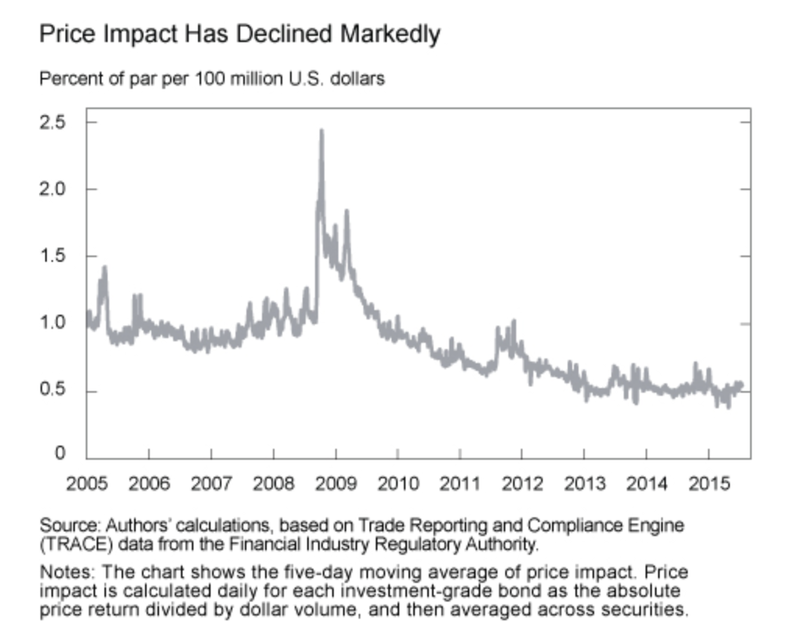 What the research has found is that the price impact of trading has declined which suggest that the market is in good shape. 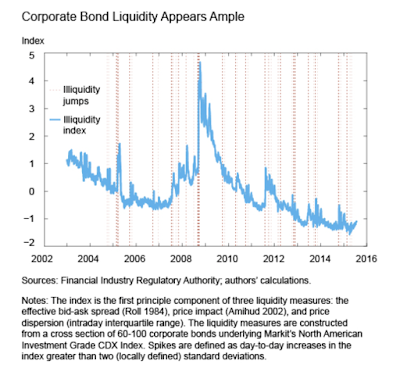 There may be illiquidity jumps, but the general measured conclusion by the Fed is that bond liquidity is ample and better than any time in the history of the corporate credit markets. Liquidity risk will move with changes in volatility, but even here the Fed can conclude that we are in much better liquidity shape than in the period before the Crisis. So should we be worried? There seems to be an active deep market that is better serving investors than before the Crisis regardless of the changes in regulation, but there have still been some very big changes in how business is getting done. The strutural change in corporate bond trading is very simple - dealers are falling out, matching engines and requests for quotes are in. Although dealer inventories have fallen relative to the debt outstanding and the amount of trading, alarm bells have not occurred because there have been changes in the way business is done. There are a growing number of platforms and matching engines in corporate bonds. Some have failed. Others have not reached critical mass. There is no single "exchange" or dominant player, but electronic matching, request for quote type systems, have moved from single digit to almost one third of the trading. Dealers are not adverse to this if they can facilitate trading and use less capital. 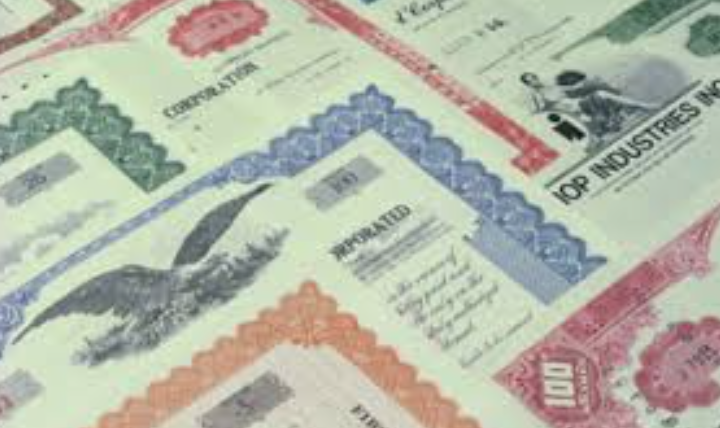 The electronic trading of equities, futures, currencies and cash Treasuries is coming to corporate bonds and this may be a savior to the market. Financial frictions and Great Recession - what are the take-aways for investors today? The primary research theme flowing through academic work is the concept that financial frictions exacerbated the Financial Crisis or Great Recession. There are many possible causes for the Financial Crisis, but it clear that financial frictions forced the markets to have even larger price moves than would have occurred in a normal recessions. Calling the Great Recession a balance sheet recession is the starting point for discussion of financial frictions because most macro economists assumed away the banking and financial system in order to make their models tractable. The balance sheet of businesses, consumers, and banks all matter, and the ability to liquidity assets or borrow are key frictions that impact spending and investment decisions. We now know that these simplifying assumption made all the difference in the world. So what are the lessons for investors today? Without going through all of the modeling, there are some key friction themes that can lead to good take-aways for the everyday trader. Not surprising, many traders intuitively understand these frictions. 1. Flows matter - Regardless of what we may think about valuations, flows will impact price. Call it herd behavior, but capital flows will have real impacts. Flows both to and from asset classes have the potential for market dislocations. Currently, the outflows from emerging markets are driving currencies, EM stocks and bonds. Where money goes and where it comes from matters a lot in the short-run. 2. Credit creation and distribution matters - Credit creation will impact prices and it will come from various sources, not just banks. The foundation of the Minsky Moment view is that speculative credit will reach for return only to be at some point disappointed. Credit will also be based on the knowledge of borrowers. This knowledge becomes more uncertain in a changing economic environment. 3. Study of credit through the banking system is not enough - A corollary to the credit creation story is that classic banking analysis is not enough to understand credit flows. The mortgage market was outside the normal banking system and was not effectively monitored by central bankers. Credit channels are complex and need to be modeled beyond a simple banking system. 4. Noise matters - There are more frictions when there is more market uncertainty. Whether Lehman, AIG, or other large financial institutions, there was a lack of clarity about the risks inside the firms. Uncertainty causes the friction of inaction. 5. Arbitrage has limits - Markets are supposed to be self-correcting with deviations in price brought back in-line through arbitrage and quasi-arbitrage activities. However, if there is a lack capital engaged in these activities, there will be persistent price deviations. Arbitrage is a function of funding and knowledge. When there is a lack of secure funding and limited players with knowledge and capital, there will be price deviations and distortions. 6. Liquidity is often in short supply - If there is a lack of credit, arbitrage, and excessive noise, liquidity will be in short supply. Money will move to safety when there is a lack of liquidity or the perception that prices may be bought or sold near true value. 7. Labor markets have frictions - Retraining, changing locations, and learning all have costs, so the growth trends can be affected if labor markets do not or cannot functions smoothly. When balance sheets are impaired, selling homes and moving, getting retrained, or even fining the right job becomes more difficult. All of the frictions on our list are to some degree still present in the economy. Regulation has impeded credit channels and distribution. Some of this is for the better, but it is natural that there will be an adjustment process which will slow distribution. The key phrase for any investor is that credit flows matter. Know your credit channels. The AI-CIO Magazine Risk Parity survey is out and it shows that the thrill has gone out of the risk parity strategy for a lot of investors. It is not going to disappear like some fashion fads, but the growth phase may be over and investors are giving this strategy a closer inspection. Public pensions and endowments have cutback on its use and smaller investors seem to be less interested in employing the strategy. 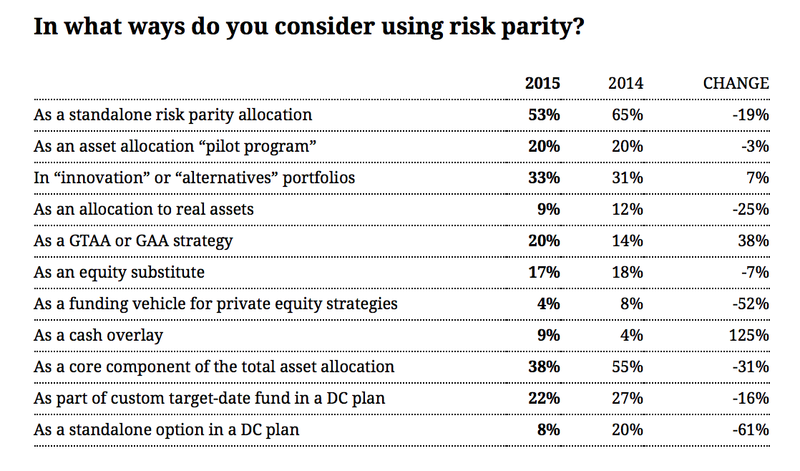 Only 19% of those surveyed are considering an increase in their allocation to risk parity over the next 12 months. How risk parity is being used is also going through a sea change. It is being more thought of as a tactical allocation strategy or a cash overlay. Most investors are also thinking about risk parity as an absolute strategy and not as a substitute for a 60/40 stock bond allocation. Performance expectations have fallen with the declines in returns. The survey also seems to suggest that it is harder to even classify how this strategy should be benchmarked with 30% falling into the other category. The heart of the issue seems to be that 2/3rds of all users are moderately to extremely concerned about performance and over half are concerned with the use of leverage and counterparty risk. 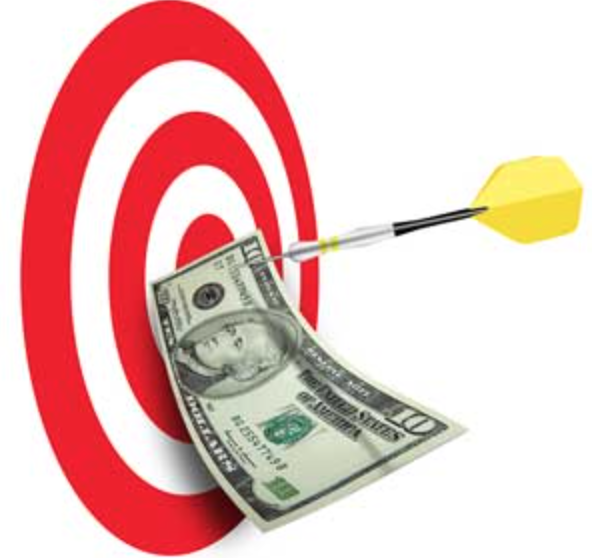 Targeting volatility and using leverage to achieve the target is a potential issue. These results are not surprising since risk parity products have not performed as well as simple stock bond allocations over the last 18 months. With the performance issues, there are concerns about education which tells me that many bought this strategy without full knowledge of how it would perform. For non-users, the key issues seem to be the same, leverage, performance, and education. Clearly, there will be greater concerns about leverage given the current low volatility environment. Performance will be an issue when there are large discrepancies between return and volatility. Performance is critical during the transitioning in volatility states. 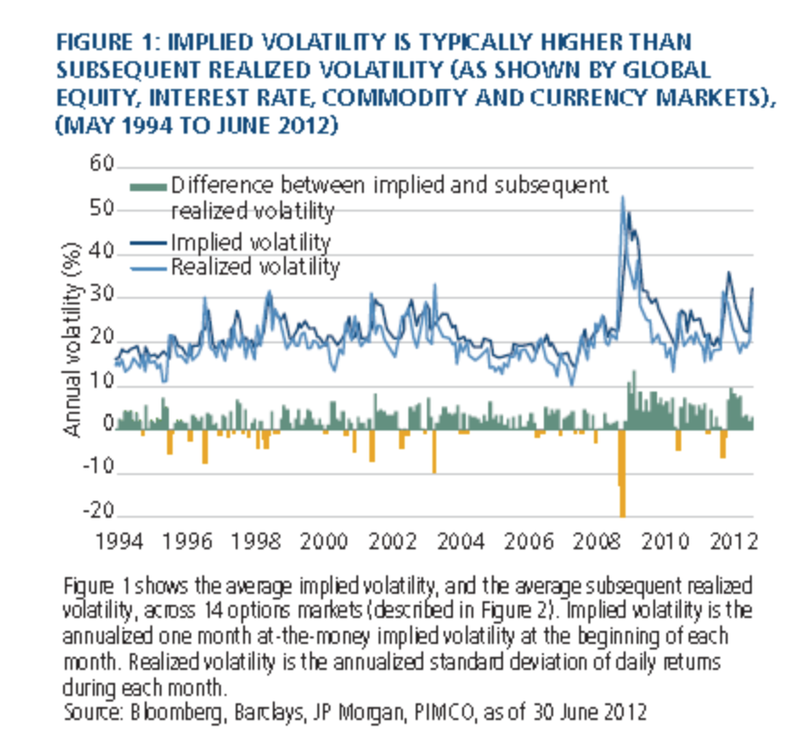 Risk parity will leverage low volatility asset classes to get parity. If volatility increases, there can be a significant decline in performance if the transition is not handled properly. Education concerns tell us that many are not clear on how to include this strategy within the context of an investor's broader portfolio. If you believe the risk parity story, why would you then make only a small allocation and leave the rest of the portfolio focused on traditional cap weightings? A key risk parity problem is one of cognitive dissonance. If you like the story of risk parity, why would you structure the rest of your portfolio in a different way that is not based on risk parity? You cannot have it both ways. Additionally, it is also hard to determine what is the appropriate benchmark for performance. Is it an absolute number or a combination of stocks and bonds? There is no benchmark agreement and confusion on how to monitor this strategy. Risk parity may be here to stay, but it is not going to dominate allocation decisions. Parity chasing is over. Experts are not all of the same. The differ not only in skill, but how they look at the world, or more importantly, their cognitive style for making forecasts. This idea of two different cognitive styles base don the type of expertise employed has been developed by Philip Tetlock, the expert on forecasting. Tetlock has been tracking the ability of experts to make predictions for decades and has come up with some very interesting results. His conclusions are not what you would think. Tetlock finds that we can classify forecasters on a continuum between those who act like hedgehogs and those that behave like foxes. The hedgehog forecaster is an expert in one area. The fox may not be as strong an expert in one single area but has knowledge that is more diffuse. The hedgehog likes to develop his forecast through a single unified idea. He like a unified theme to justify his forecast based on his deep knowledge. The fox is more willing to try different ideas or call upon different information. He is willing to present competing ideas to generate his forecast. There is no question we respect the expert hedgehogs albeit they may be a tad insufferable given their focus and knowledge. The fox is willing to change his mind and may provide multiples explanations for a forecast. They may be madding to be around since they may be holding onto multiple ideas. Still, the issue is whether one approach is better than the other for forecasting. So which cognitive style is better? Tetlock finds that foxes do better with both short-term and long-term forecasting. Not being wed to a single way of thinking seems to have significant advantages over one idea or theory. This seems to be especially the case when there is a high degree of uncertainty with the forecasting problem. The "experts" often are unable to see beyond their current thinking, so they miss big changes. Hedgehogs provide knowledge but often miss the changes. The foxes are more open or accepting of change. The hedgehog and fox construct can even be used with discussing systematic trading. 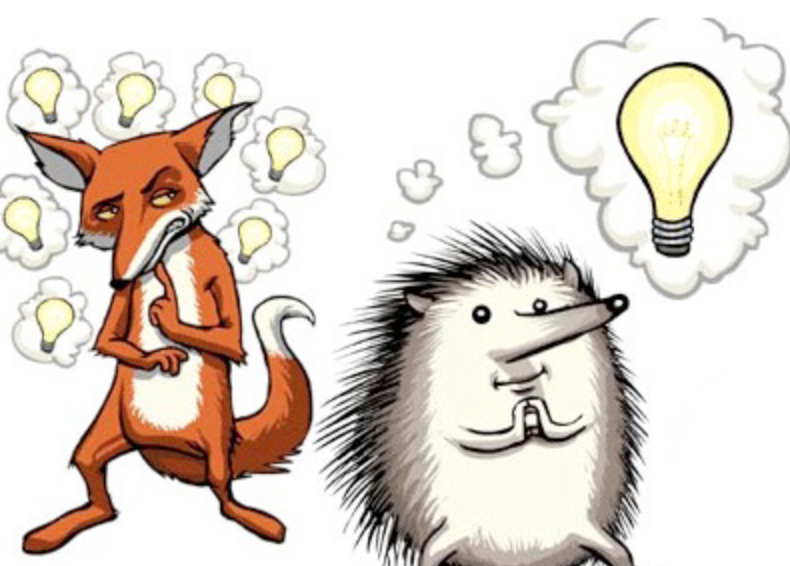 The hedgehog is the trader who employs one big unified model to make his decisions. The manager who is a fox is likely to use multiple models and have a weighing scheme between them. He is unlikely to rely on a single model for decision-making. The Tetlock work does not suggest that you should avoid becoming an expert or doing you homework for any forecasting project. It does suggest that being open to multiple ideas is important and a style of singular thinking is not effective. There has been an active discussion on the global volatility premium, the difference between implied volatility and subsequent realized volatility, yet the research on how this risk premium would fit within an asset allocation strategy has been lacking. Nevertheless, we now have a better understanding of the benefits and risks with the research by William Fallon, James Park, and Danny Yu in "Asset Allocation Implications of the Global Volatility Premium". There is a volatility premium that exists across all major asset classes. The mean difference between implied volatility and realized volatility is positive across equities, fixed income, currencies, and commodities. 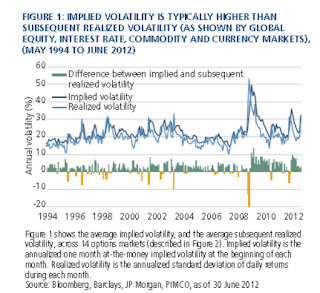 The size may vary but the volatility premium is global. Selling volatility will added return and have strong positive Sharpe ratios. This seems like an easy way to add returns to a portfolio except there are some significant risks. First, there is a crash risk or negative skew with selling volatility. Investors will make good money with selling volatility only to be hit with a strong negative return when there is a volatility spike. This may seem manageable except that the vol spikes come at the wrong time. Volatility spikes when there are "bad times", those periods when equity returns have a significant fall. Hence, there is poor diversification benefit when a volatility premium strategy is employed. Returns will be added, but the cost will be compounded by losses when there is a market downturn. These can be reduced through focusing on liquid markets, but crash and diversification risks are still present. Trading volatility premium can be a consistent return enhancer with a Sharpe ratio (close to 1), but there are special risks which will make any investor nervous. Investors who have high loss aversion will find this a difficult risk premium to add to a portfolio. Crash risk at the wrong time will mean that investors will be penalized for this added return. Volatility premium trading is a useful excess return strategy but the investor has to have a special awareness of these risks. 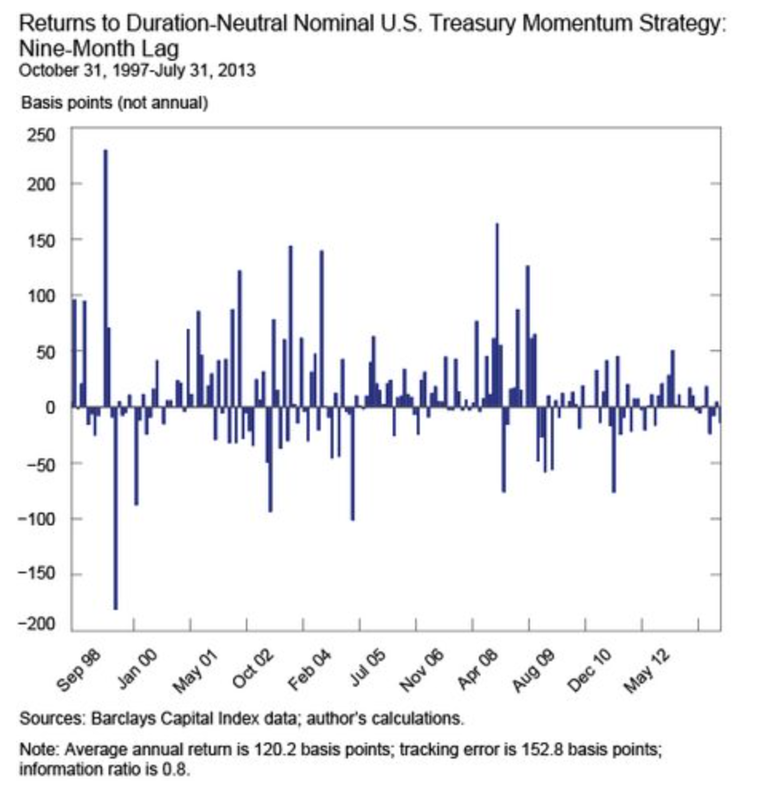 Momentum trading Treasuries - it works! There has been significant research on momentum strategies across all major asset classes; however, the amount of effort used to investigate the efficacy of momentum strategies in fixed income has been limited. This limitation has changed with the work by J Benson Durham, Can Long-only Investors Use Momentum to Beat the US Treasury Market?". Durham shows that long-only fixed income momentum strategies can provided excess returns and good information ratios through forming duration-neutral portfolios along the Treasury yield curve. 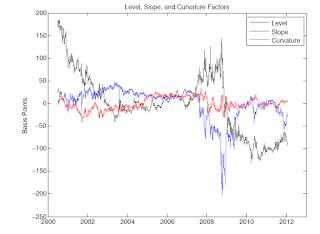 Breaking up the yield curve into buckets and determining what combination of bucket to hold based on momentum while still keeping the duration the same as a long-only portfolio of Treasuries is an effective means of control for directional risk. This momentum is robust across a wide number of specifications. The author then compares the excess returns against other factors such a term structure changes to see if there are variables that can explain these excess returns from momentum. The answer found is that momentum cannot be explained by other factors. Investors who use momentum across different maturity buckets will be rewarded versus just holding the market basket of Treasuries. Futures traders have known this for some time. Once yield markets start to move in a specific direction they will usually continue in that direction. Additionally, there is value in trading different maturities. Different maturities do not all trade the same and a basket of momentum trades will add value. These same results also occur in the UK bond market but not carry-over to the Japanese bond market. This work just adds to our knowledge that momentum is a risk factor that cuts across all asset classes and careful research that tries to correlate momentum with other economic risk factors will usually come up empty-handed. The SEC is proposing new rules on mutual fund and ETF liquidity. Last year there were instituted new rules on liquidity for money market funds. Fund managers will have to measure or bucket all assets based on their relative liquidity. The Fed has focused a significant amount of research on determining the level of liquidity in the Treasury and corporate bond markets over the last year. ECB president Draghi and many of the biggest players in the bond market have all commented on current liquidity issues in fixed income. The underlying feeling by market practitioners is that liquidity across all major asset classes is not as deep as before the Financial Crisis regardless of the research. Liquidity events in the form of flash crashes seem to have hit every major asset class. 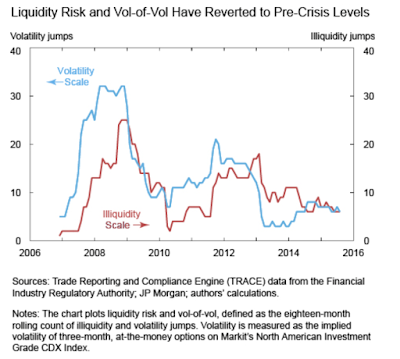 The number two risk issue from the Credit Suisse 2015 hedge fund investor survey was market liquidity. Nevertheless, we do to have many readily available measures of market liquidity. Measures of bid-ask spread, volume, or average trade size are helpful in providing information on liquidity but does not tell us whether liquidity will be available upon demand. The liquidity definition, "we know it when we see it", is not helpful in measuring the real problem. Showing specific situations of low liquidity is interesting and important but plays into the "law of small numbers" bias, extrapolating from a few examples. Still, the old adage that you never have liquidity when you need it still apples. A set of rules that require measures of liquidity based on time limits needed for liquidation may not get at the real issue. The basis for measuring liquidity is still not clear and asking for buckets is not a solution. Two managers may not agree on the amount of time necessary to liquidate without market impact the same sized position. Asking for portfolio buckets of this liquidity may only give regulators and investors a false sense that liquidity is measurable. 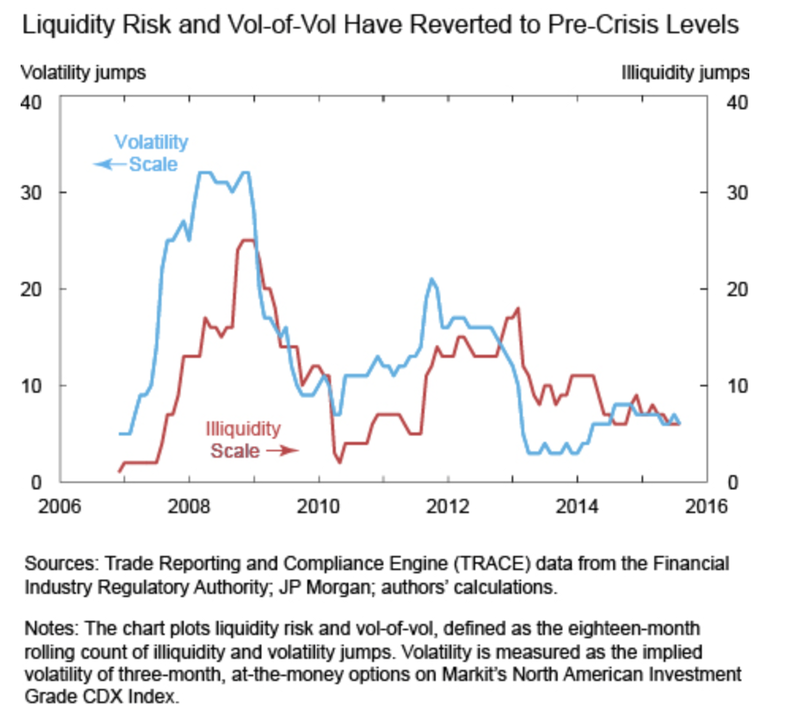 A false hope that liquidity can be effectively measured may only increase risk in a crisis. 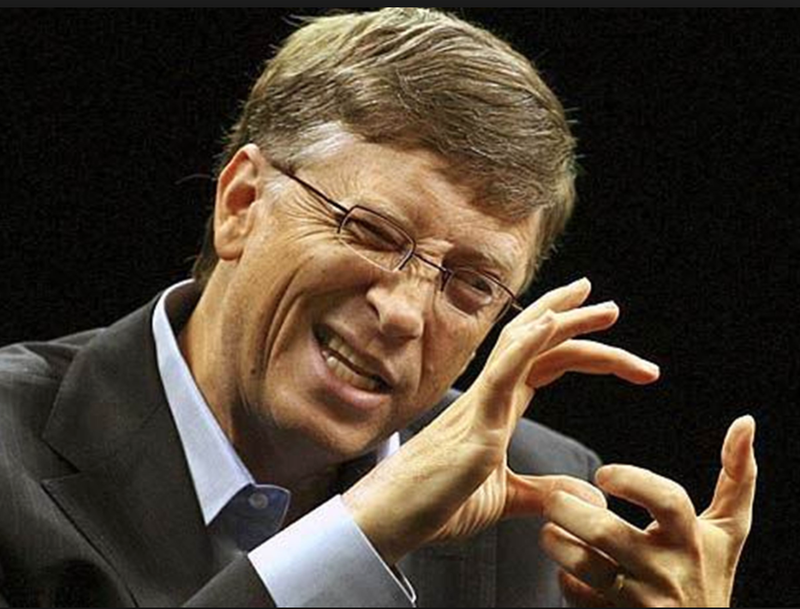 Bill Gates was talking about the computer industry but his thoughts also apply to money management. You need a good investment strategy, period. 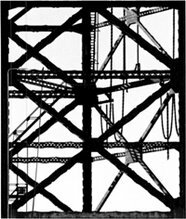 If there is no structure or strong foundation to the investment strategy, you will fail. But, strategy is not enough. The execution of the strategy matters. The details of conducting research, sizing positions, trading, and employing good risk management all matter. You can articulate a good strategy but without the skill to execute, performance will not be generated and you will fail. What applies to business also applies to money management, strategy and execution goes hand-in-hand. Many are familiar with the first Star Trek television series. 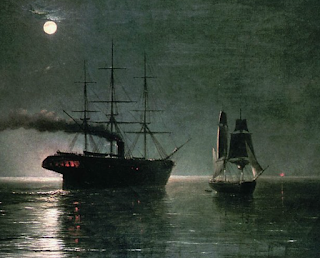 The main characters represented a study in contrasts and can serve as a simple example of how decisions and forecasts need to balance different behaviors. Mr. Spock was the pure analytical thinker without emotions. He never let emotions enter his decision process nor did he willingly accept emotions as a driver in the decisions of others. Dr. McCoy, despite his good skills, bordered more on the emotion side. He was often frustrated by the situations around him and let his emotions influence his decisions. 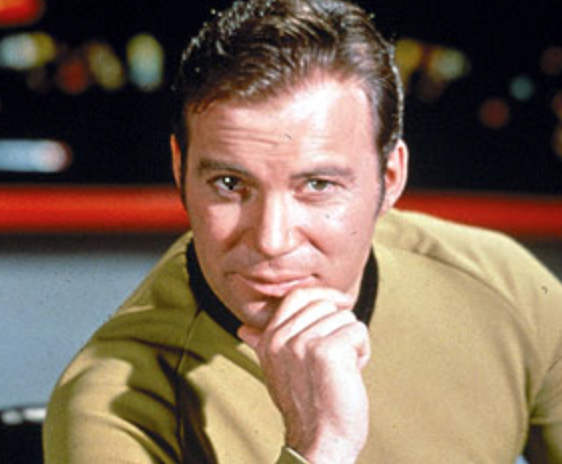 Finally, you has the lead character, Captain Kirk, who often showed balance between the extremes of his two close friends. He was a combination of disciplined analytic thinking and emotions associated with judgments made under uncertainty. He needed the different points of view of Spock and McCoy to help balance his decision-making. If we applied Daniel Kahneman thinking to the characters, Mr Spock represents System 2 analytical thinking while Dr. McCoy is a system 1 thinker who often follows simple rules of thumb or heuristics to make quick decisions. These characters can be used as the basis for extremes in decision-making. The captain balances these extremes in order to help his decision-making and forecasting. This nice analogy was developed in the new book Superforcasting by Philip Tetlock and Dan Gardner. The quant is the Mr Spock of forecasting and money management. The numbers do not lie. The focus is only on what is rational and really does not accept the fact that irrationality can be a driver of markets. The pure quant approach will have limitations because non-rational behavior does not enter into market explanations. The Dr McCoy approach represents the decision-maker and money manager who will get emotional We have to accept the fact that the world is not always rational and there will be decision-makers who will be driven by emotions. Being emotional is not going to help with analytical reasoning, but accepting that emotion can drive decisions and markets is important. The world is a combination of rational logic with periods of emotions that will sway rational opinions. Captain Kirk needs to balance the thinking of his two friends. He has to employ strong analytical reasoning but also accept that emotions will affect the behavior of others and will skew forecasts from just pure rational behavior. Kirk, if a market analyst, would balance the rational and emotional behavior embedded in prices in order to to make better decisions. He would accept that market prices are a combination of System 1 (heursitics and quick decisions) and System 2 (deep logical analysis) thinking. Market prices may deviation from fundamentals because it is a weighted average of these two types of thinking. The hard part for forecasting is that the weights will change with conditions; nevertheless, appreciating that market behavior is a balance of rational and emotional actions is critical. The SEC has proposed a set of liquidity rules for mutual funds. This is an extension of the liquidity rules set-up for money market funds last year. The SEC says - know your liquidity. Mutual funds and ETF's will have to bucket or categorize all assets held based on the ability to sell in a reasonable time. The purpose is to eliminate the potential for a run on the fund with forced liquidations by mutual funds in stock and bond markets in an effort to raise cash for redemptions. The SEC will also consider swing-pricing proposals on shareholder's trading activity. board approval and review of the liquidity management plan and measurement. These rules are coming out of the Financial Crisis in order to solve perceived liquidity problems in mutual funds. If you are going to allow daily liquidity of mutual funds, there is the potential for a liquidity crisis if the assets held cannot be sold on a daily basis. This is a classic bank liquidity problem when demand deposits can be withdrawn daily but the underlying investments of the bank may not be as liquid. 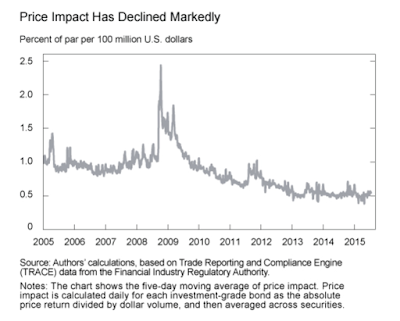 However, like the impact on money market funds, there will be unintended consequences. There will be a drag on mutual fund performance from forcing managers to weigh assets by liquidity buckets. Performance of funds will fall below the returns of benchmark indices. The cost of capital of less liquid assets will also increase. If you cannot prove you are liquid assets, you will trade at a discount. If there is a change in liquidity, there will be a negative feedback loop whereby assets will be sold based on perceived liquidity and not valuation. Life will be harder for managers and performance will deteriorate for investors based on the potential of a liquidity crisis. Liquidity will not be defined classified, and managed like never before and that will impact returns. There are two major opinions concerning what Fed policy. One is the misallocation view. The other is the fragile economy view. These two views are like two ships passing in the night without any acknowledgement of each other's presence. There cannot be agreement on policy action because the view of the world are so different. With the misallocation view, the Fed has to raise rates because the current zero rate policy is distorting the allocation of capital and that distortion needs to stop. There are bubbles lurking in financial markets and the zero rate policy has been the key driver. The zero rate policy has caused the reach for yield by investors which means more risk-taking than is appropriate for the economy. It does not matter whether there is limited inflation. It does not matter whether trend growth is lower than the pre-crisis levels. The seeds of another crisis are brewing, so rates should be raised now. In the fragile economy view, the Fed should hold rates low because the economy is still fragile and the Fed should not take the downside risk of raising rates too soon. Rates have to stay low to get the economy out of the current secular stagnation. There is no bubble or financial crisis because the economy is not overheating and inflation is well below the target rate. There may be a distortion but that should lead to more risk-taking and reduce the demand for money. It is a battle between a real economy view and a financial economy view. The misallocation or financial risk story can point to further increases in leverage outside the consumer. Misallocation view is an argument based on the potential for a crisis. The real economy, secular stagnation, view is based on output gaps and potential GDP. It is a story of economic potential. As long as these world views are so different, it is unlikely we can get agreement on what should be the right Fed policy. 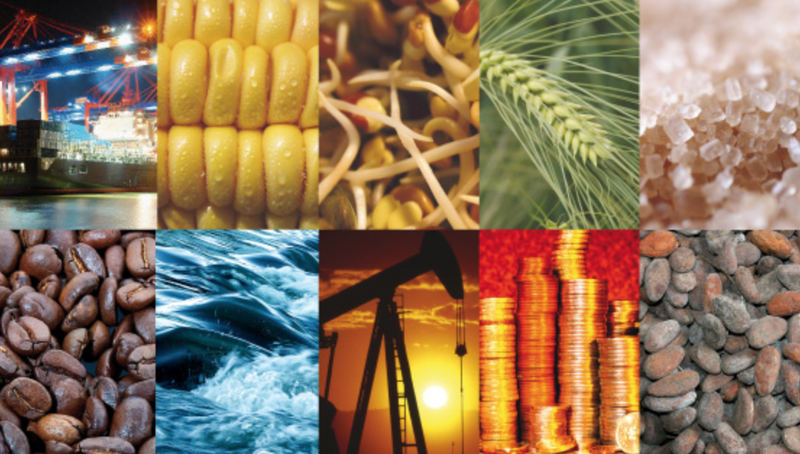 Commodities markets are not all the same and some of our assumptions concerning long-term real prices are wrong. Bundling all commodities together is wrong. 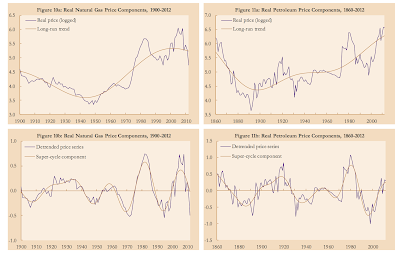 Of course, for many investors these conclusions are obvious, but the historical price research by David Jacks of Simon Fraser University shows in great detail that over the long-run real prices for commodities can behave very differently. 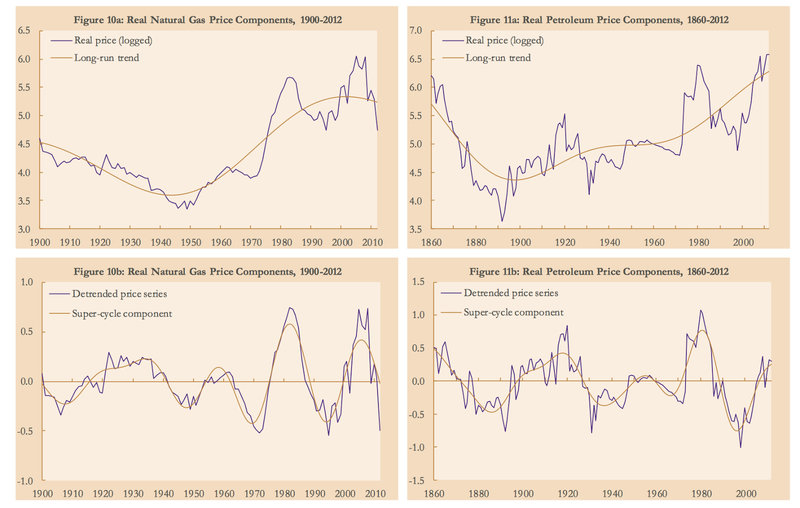 See his paper "From Boom to Bust: A Typology of Real Commodity Prices in the Long Run". Jacks does a good job of providing detailed information on real prices for 30 different commodities over 160 years. He provides a wealth of charts in his paper. His key conclusions should be remembered by any commodity investor. There are some simple broad views about long-run commodity prices. First, they can have long cycles. Call it super-cycles, but commodities can go through strong uptrends from a combination of supply shortages and increased demand only to reverse after production catches up with demand. These cycles can last well over a decade but will eventually be reversed. Second, the real prices of commodities have not all been declining. There is the adage that being long commodities means being short technology. The reality is more complex and cannot be applied to all markets. The more recent decades have shown an increase in real prices versus the earlier history presented. 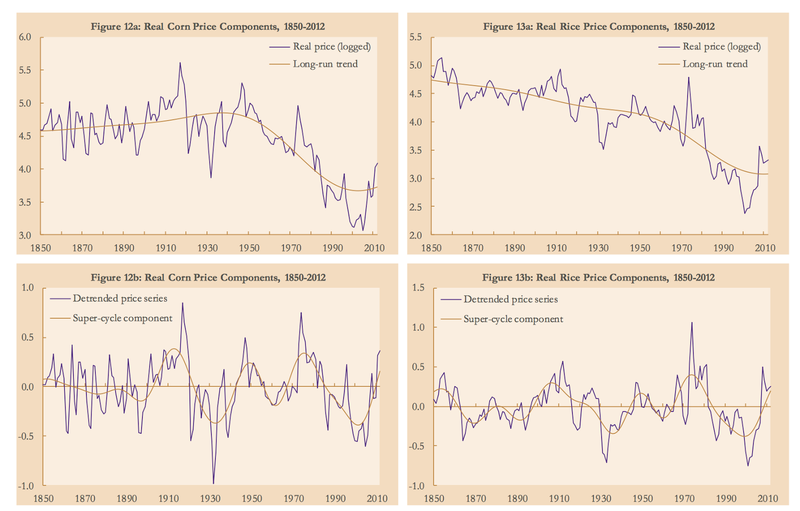 Third, periods of boom and busts occur with large swings in prices. These have not been dampened over the last few decades. In fact, the swings have been more extreme. As important as the general price conclusions is the fact that all commodities cannot be classified the same. Nevertheless, we can break commodities into two major types, commodities to be grown and commodities in the ground. 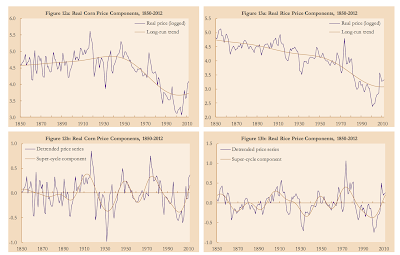 In general, we can conclude that commodities to be grown have shown secular real price declines. There have been technological advancements that have led to higher productivity in growing. You can think of the advancements in genetics, fertilizer, and mechanization to increase productivity as the drivers of the real price decline. For commodities in the ground, there is a different story. We may be able to better extract oil and minerals, but the supply is still finite. As the supply is used, there is a battle between better technology and the difficulty of extraction. All commodities cannot be classified as the same and even in the short-run, the dynamics of growing versus extracting are important. Here is a sample of the charts developed in the paper. Why are there biases in economic forecasts? We have been steeped in the belief that full information rational expectations are the basis for economic modeling. Individuals use all available information to generate unbiased for economic forecasts. There can be errors, but, on average, the expected value is zero because smart forecasters will drive out poor forecasters from the market. There will not be any biases and errors because all information is used. If there is a difference between the forecast and the realized value, it will be cause by new unanticipated information. Unfortunately we find that there are errors and biases in forecasts and the world does not seem to behave in the expected rational manner. There is a correlation between forecast revisions and forecast errors. There has been some path-breaking work on information rigidity that can help explain why there may be errors in forecasts and why they may not go away. The piece, "Information Rigidity and the Expectations Formation Process: A Simple Framework and New Facts" by O. Coibion and Y. Gorodnichenko in the August American Economic Review provide some insights on why errors occur and how we can exploit these problems. There has been a view that forecast errors occur because of loss aversion by forecasters. It is a behavioral issue. But, the correlation between revisions and errors does not have the correct sign for this story. What seems more likely is that there are forecast errors from information rigidities. These rigidities occur through two possible channels. One, there are rigidity from infrequent updates because of fixed costs of forming the forecasts. This does not seem likely since there is a low cost of gathering information within macroeconomics, but even with low information costs there is a cost with going through the forecasting process. Sticky forecasts seem more likely for forecasts on the micro-level where costs may be higher. Two, noisy information creates a signal extraction problem. When there is more noise in the information gathered, there will be less willingness to change. There is a rigidity between the prior beliefs and the information that will form new beliefs. Forecasts can be affected by sticky behavior and noisy prices. Both of these will cause a link between forecast revisions and errors. 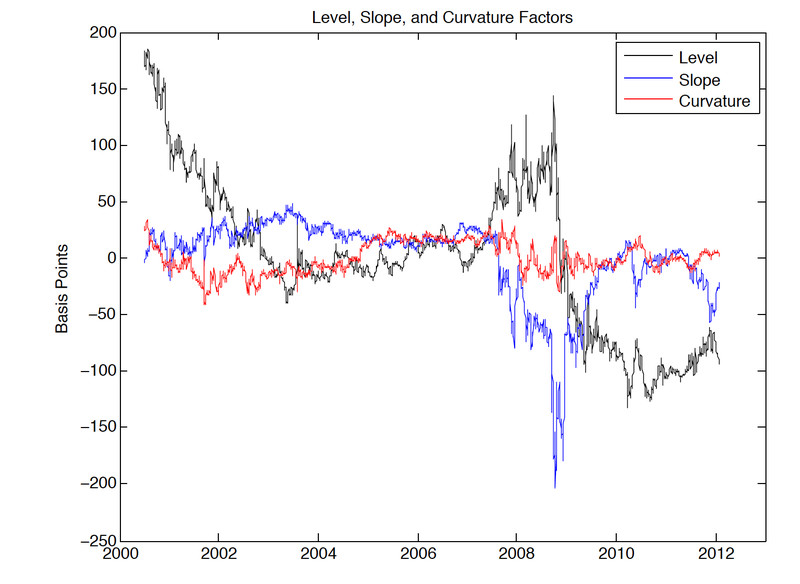 The behavior of the forecaster can be rational but the information rigidities can still create errors in the formation process. So what can be done by those who trade? Two simple solutions make sense given information rigidity problems. First, update forecasting regularly with the latest information. Stop from being sticky. This can be in the form of nowcasting. Use the best available information without delay. Forecast should be updated at the worst on a monthly basis. Second, be aware of priors. a strong prior view will be slow adjustment to any new information. The noisy information problem is harder to address because it requires a willingness to change when new information enters the market. This issue will have to be balanced against transaction costs, but there cannot be a fear of changing forecasts. Investors should always worry about whether they are using all information and forming rational forecasts. They should not worry about information rigidities if they better plan their processes. 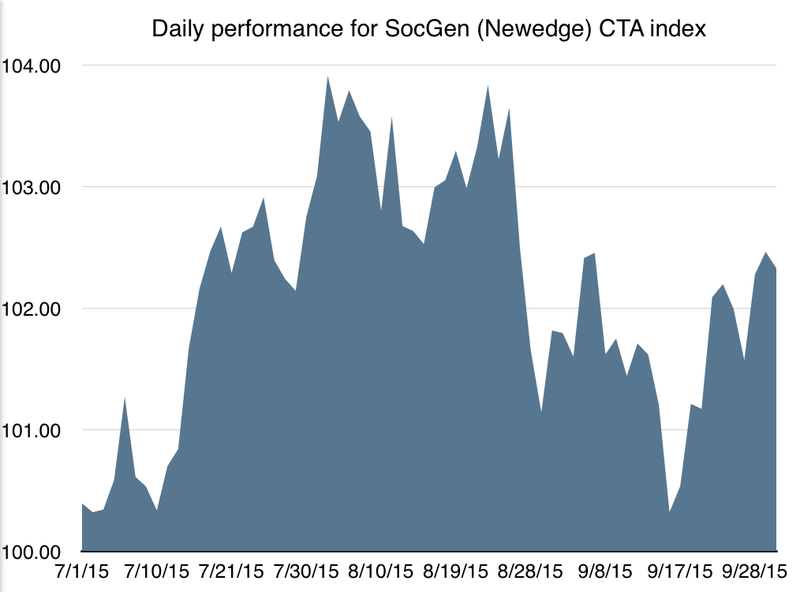 Nowcasting and trend-following - cut from the same cloth? There has been a movement in forecasting to better exploit information in real time. To a degree this has always been done on Wall Street, but the process has become more formal with structure on how information can be employed to enhance short-term forecasts. This process has been given the name - nowcasting which is the contraction of "now" and "forecasting". It has been effectively used in meteorology and macroeconomics especially with central banks who want to get better real time estimates of the key macro-variables. We think this forecast movement is a major advancement in thinking that can be more effectively incorporated in global macro investing. There is no secret formula for nowcasting; rather, it is an approach on how to use all available data that may have different frequencies, look-back periods, and sampling error. It is the use of ensembles of forecasts with different time scales and information quality to generated the best short-term forecasts. One of the key issues with macro forecasts is that many of the key variable used are faced with delays, are infrequent, and subject to sampling error. For example, GDP comes out once a quarter with a delay but a lot of the information that comprises GDP is available sooner albeit in different forms. These data can be used to better estimate GDP to give an immediate forecasts. Hence, if you use macro variables to generate signals on what you should do, there will be little action that can be taken between fundamental data points. There are no short-term forecasts. If the data used comes out monthly, you can only make a forecast once a month, yet markets trade everyday. Nevertheless, investors actually have more data available that can be employed to make short-term forecast. Some comes out weekly, other come out monthly but may have less delay in its look-back. In some sense, trend-following is a nowcast using just price information. In fact, you can see why trend-following has appeal as a nowcast for trading. You can get a short-term forecast immediately through extrapolating recent price activity. The nowcast from a price based system will be to use trends with different look-back periods to provide different types of information, short, medium, and long-term. The can be weighted to form a better forecast. You don't have to wait for data on unemployment or GDP if you nowcast using price. However, if you truly want to use all available information, price data may not be enough. A more sophisticated nowcast will be to use both price and fundamental information as an ensemble. In the case of stocks, the nowcast can look at price trend with earnings information. The bond trader will use price, yield curve, central bank, and economic fundamentals. The commodity trader may combine price with forward curves, and inventory information. 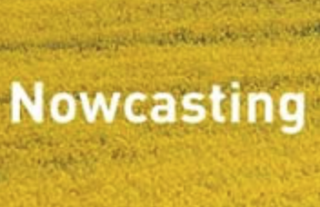 Nowcasts can use different information blends to make better forecasts. While we have just scratched the surface for what is a nowcast and how it can be used, the concept can better focus the thinking of any macro-trader. The integration of different data with different frequency is a better use of computing power than perhaps looking for the new best model in one time frame. Since the Financial Crisis, there has been significant discussion about Hyman Minsky and Minsky moments. The Minsky moment would be a sudden market collapse caused by a long period of prosperity or low volatility that led to increased speculative behavior. When there is a long period of market calm and prosperity, there is a greater willingness to borrow and take on speculative investments. If there is a reach for yield in calm periods, an overreach will lead to the potential for a market collapse. Unfortunately, the next market collapse may not come in the same way as the last. While regulators have worked to reduce bank leverage, the next collapse will likely come from somewhere else. The next crisis may come from the lack of liquidity in bond mutual funds who have reached for yield. The WSJ has done a nice piece of research on the lack of liquidity in some bonds funds. These are the big funds, so the problem is real. 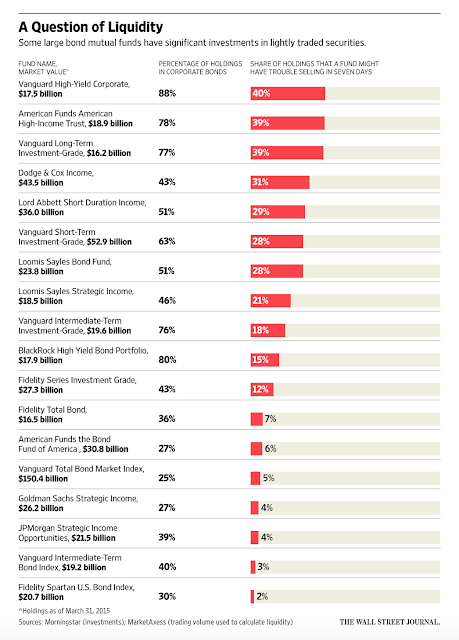 The eight largest funds represent close to $200 billion in assets and each have more than 20 percent in illiquid assets. These funds are not borrowing money, but with daily liquidity, there is the potential for a run on the fund. If there are large outflows from mutual funds and the illiquid assets cannot be sold, then these risky assets will become a greater portion of the assets and increase fund risk. This could lead to more fund selling and a further increase in illiquid assets as a percentage of the fund, or there is forced selling of illiquid assets which leads to poorer pricing. In either case, there is a negative feedback loop that cannot be easily stopped. This will qualify as a Minsky Moment. We think a closer look at bond mutual funds and bond ETF's is warranted as potential place for the next crisis especially if we have a rising rate market. Market distortions in supply or demand will show up in prices, but the reasoning may not always be obvious. This is the case in swap spreads along the yield curve. We do not pretend to solve this issue but highlight this market distortion. The standard view on swap spreads is that they should always be higher than Treasury yields for the simple reason that risky assets should always trade at a yield premium to less risky assets. Yet, in the current swap market that is not the case. We have seen long-term swaps turn negative after the 2008 Financial Crisis and have for the most part they have stayed that way. Now we have negative swap spreads down to 7-years and 2-year swaps hovering at zero. This does not make sense in a world where swaps are risky than Treasuries, so that means one of two things. Either the world is abnormal or the assumption that there is a risk premium that should always be positive is wrong. The possible reasons for a negative swap spread have mixed rationale, but we are in the camp that there is not an abnormality but a refection of segmentation. Treasuries are riskier than swaps. This would means that the probability of payment of principal and interest for a government bond is less than a swap. This is highly unlikely, but could be possible if you consider that a swap is with differential cash flows and not a payment of interest and principal. The risk of the swap is the replacement cost of rates at the time the swap is adjusted or offset. This a possible explanation, but someone has the explain why the swap rates have gone negative during a crisis and more recently. There is more corporate hedging. 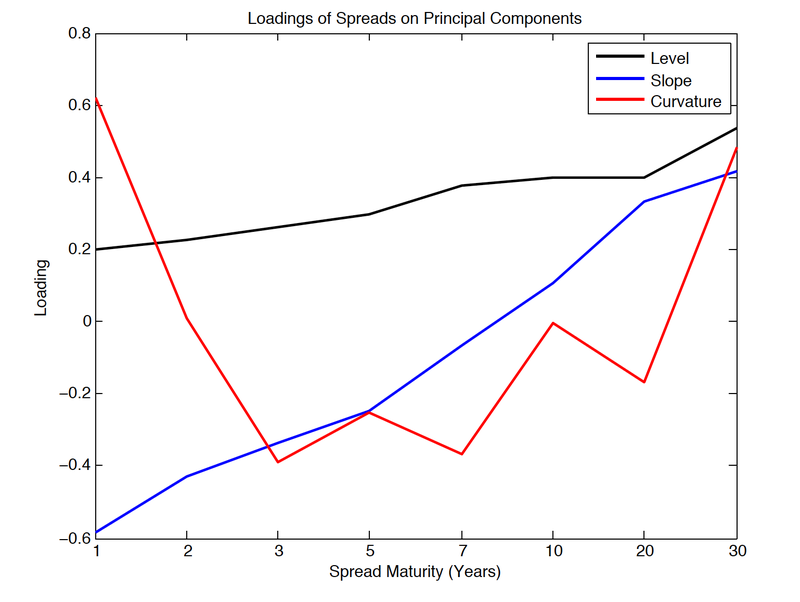 This will cause tightening, but it cannot explain why spreads will go negative. The answer that hedging is so great that it offsets credit risk seems to be a hollow rationale. The yield curve is steepening. This makes sense that the spreads will tighten in a steepening yield curve, but it does not make sense that the spreads will move through zero. 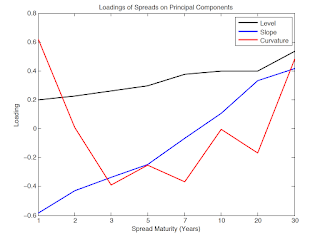 There has been work on decomposing the behavior of swaps spreads. Josephine Smith from NYU has looked at the principal components of swap spreads and shows that the sensitivity is highly variable, yet this uncertainty does not translate to negative swap spreads. Swap spreads reflect the different between LIBOR and repo. The TED spreads has been widening over the last year albeit it has not been anywhere close to the 2008 period or the 2011-2012 period. In this case, you can finance bonds with repo, pay fixed to receive LIBOR. The financing argument seems to make more sense, but it cannot explain why some parts of the curve will go negative and others will not. Certainly, this type of financing argument is harder to use for long periods. Supply and demand issues. If there is excess supply of governments, they can cheapen relative to swaps. This can create a situation where swap spreads are negative because there are limits to arbitrage and there is no one willing to do a swap to collect the better rates. When there is massive new supply, selling pressure, or high uncertainty that will preclude swap activity, there will be the chance of a negative spreads. This seems to be a likely scenario that can explain some of the recent facts. This argument rests on the idea that there is market segmentation that can be so great that there is not enough capital to bring the swap and Treasury markets not alignment. With capital charges for holding bonds different than swaps, financing uncertainty, and large selling or buying activity from central banks, the segmentation argument can provide a story that seems reasonable. Regulatory changes have distorted the movement an commitment of capital. We are not arguing that this is inherently bad, but it is a cause. Market distortions are important to watch because they will spillover to other markets and great more opportunities for those that are not financially impaired. I am not afraid of running with the ideas of others, or at least using a good turn of phase. Picasso said, "Good artists copy, great artists steal." David Darst, who has been a good strategist for a very long time, was quoted as saying that he is focusing on the six C's as the key investment themes for the fourth quarter. I do not fully agree with his stories, but I am in full agreement that the C's are what you have to watch. Before launching into the six C's, I will note the value of using devices to help focus attention and memory. Most investors cannot hold more than three to four ideas at a time, so using tools to focus on what is important is not trivial. It is a useful heuristic. Credit - The high yield markets have backed up especially for the energy and commodity sectors. While there has been some firming of markets in the post-September FOMC, there has been a new wariness on credit. The spreads are now at three year highs and while not at 2011 levels suggest a more careful look. This is especially the case for emerging markets where net annual outflows have turned negative for the first time since 1988. Defaults have not appreciable increased but that would be the next shoe to drop if there is a global growth slowdown. Currencies - The main story in currencies has been the dollar gain based on the expectation of a Fed rate increase. Now that the main story for a dollar increase has been kicked to the curb we expect that there will be at best a sideways movement of the dollar. Nevertheless, a tailwind for the dollar is EM outflows and the fact that the growth in the US may be less uncertain than the EM world. Commodities - Glencore is the commodity equity canary in the coal mine. The super cycle has clearly turned, but has not hit bottom. The Bloomberg commodity index saw the worst quarter since 2008. Slow global demand and a supply problem that has to be further solved means downward pressure on commodities is still present. Oil prices may have increased on geopolitical tensions and production declines in the US since July, but neither is enough to solve this critical supply-demand imbalance. China - Stock prices have firmed slightly only because the government has used every policy alternative available to arrest the decline. The key story is growth and there is a growing fear that the numbers we are seeing out of China should be viewed with skepticism. Now, the government is using both fiscal and monetary policy to help the economy, but confidence problem means that many investors are biased against China growth. Crude oil - We have discussed commodities, but crude still has a special place within the asset class. Loans terms for oil companies are being revised based on new reserve value estimates. There is a energy credit problem that is growing. SWF assets are mainly driven by oil revenue, so there has been rebalancing of portfolios which will place pressure on hedge funds. DM consumers have benefited from lower oil prices, but it is unclear whether that is enough to offset the drag on EM countries. Corporate profits - Entering earnings season with slow growth and a strong dollar means that we have see surprises on the downside. Earnings from overseas operations represents over 45 percent for companies in the S&P 500. Poor earnings and a negative technical equity bias will place more pressure on equity markets. 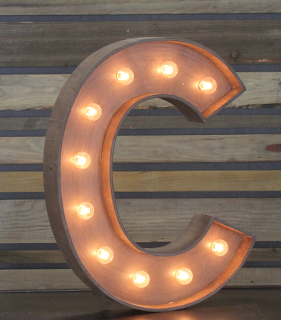 The fourth quarter will be driven by the six C's and most of this focus will be on the negative. If the stock market goes down relative to a hedge fund's performance, the hedge fund manager may say the fund was successful because it beat the equity index even if the fund generated a negative return. Stocks go up and a hedge fund manager may say they were trying to be a bond substitute. The fund was not supposed to beat the equity market. In this competitive world where benchmark comparisons are not well established, there is a lot of switching of performance metrics. Investors have to agree on the metrics early in the process. 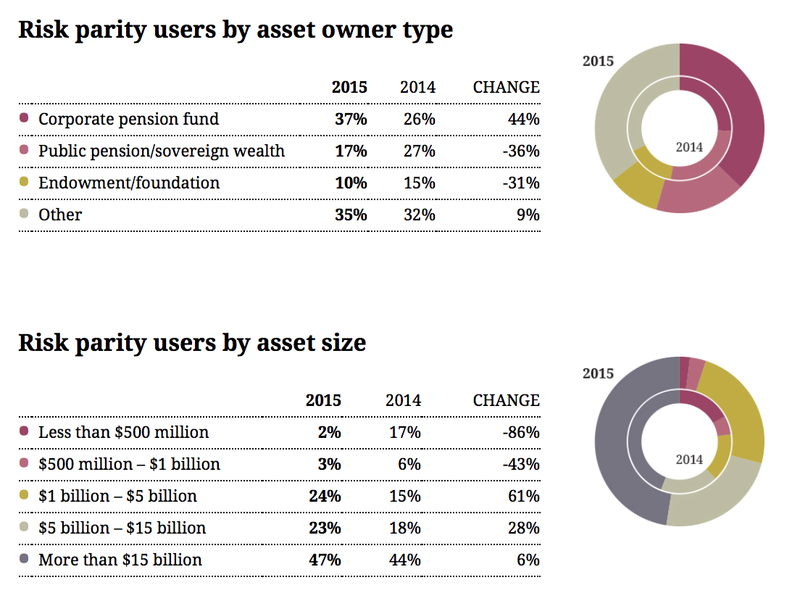 2015 is already shaping up to be one of those years of changing the goalposts for hedge funds. So what is the right comparison? Setting benchmarks is not an easy question, but there is an issue if hedge fund managers switch back and forth based on the latest performance numbers. This may not be a fair assessment, but most investors are looking for two things. Better diversification and limited performance drag versus traditional stocks and bonds for the diversification received. There is the belief that hedge fund investors will give up long-term return versus equities in exchange for diversification, but the return shortfall should not be greater than bonds which also offer diversification. Bonds may underperform stocks but you gain diversification and lower risk. The same framework should be applicable to hedge funds. Lower returns are acceptable if you get a strong boost of diversification. However, if you provide less diversification than bonds, you better not see a performance drag versus bonds. Let's look at 2015 as an example of the issue. There were four styles that beat both stocks and bonds. There were four styles that underperformed both stocks and bonds. The rest of the styles or just under 60% have shown performance between the two extremes. This may be what we should expect. Most hedge funds have betas that are less than one but are likely to have a beta that is higher than bonds. The bracketing of performance around bonds and stocks is a nice simple way to determine what hedge funds are doing for an investor. This should then be compared with the degree of diversification. In this context, hedge fund returns are acceptable but certainly not stellar. Managed futures index beats equities but not bonds - sort of a good year-to-date? What is the right traditional asset benchmark for determining the value of a managed futures fund or portfolio? This is not a easy problem because there is a big difference if you choose an equity or fixed income benchmark. The diversification mantra for managed futures has been that it adds value when there are "bad times" such as a recession or an asset market sell-off. Some have argued that managed futures has a crisis alpha and have measured the excess return during these bad time periods. Managed futures will do better when there is a market dislocation. A normal marketing chart shows that managed futures will do well when stocks have a sell-off like the Tech bubble decline, the Asian crisis, and the Great Recession. However, bonds also did well during those crisis periods. Given the lower return profile of managed futures over the last few years, some have now stated that managed futures is a good bond substitute. In fact, many say that the allocation to alternative investments should come from bonds. So which one should be used for comparison? Of course, what is perhaps the odd answer is both. Managed futures should provide better diversification than bonds in bad times and it should have a better return profile than the yield carry from bonds. That said, given the active trading and volatility, managed futures should match closer to stock index returns over the long-run but with diversification benefits. Certainly, the information ratio should be higher than either. This is the holy grail. The graph above shows the SocGen (Newedge) CTA index compared with stocks and bonds through the first three quarters of the year. Managed futures beat both in the first quarter, underperformed both in the second quarter and now has served as crisis alpha versus equities in the third quarter. Bonds actually did better in the third quarter and has had a smoother return. Managed futures have been between the two major asset class returns. No strategy should be judged on a nine month period, but a close comparison provides more information on the usefulness of this alternative strategy. The performance of the managed futures index through the first nine months has been mixed. 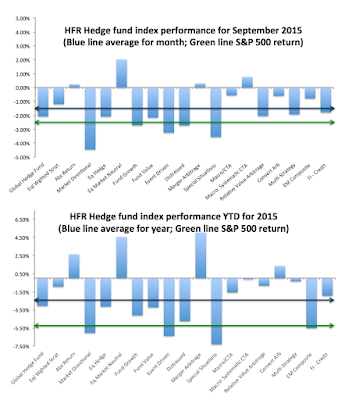 News headlines have focused on the poor performance of hedge funds for month of September. This was not a great period for gains. Many strategies may have been surprised by the Fed, but there were a few bright spots in a lackluster month. 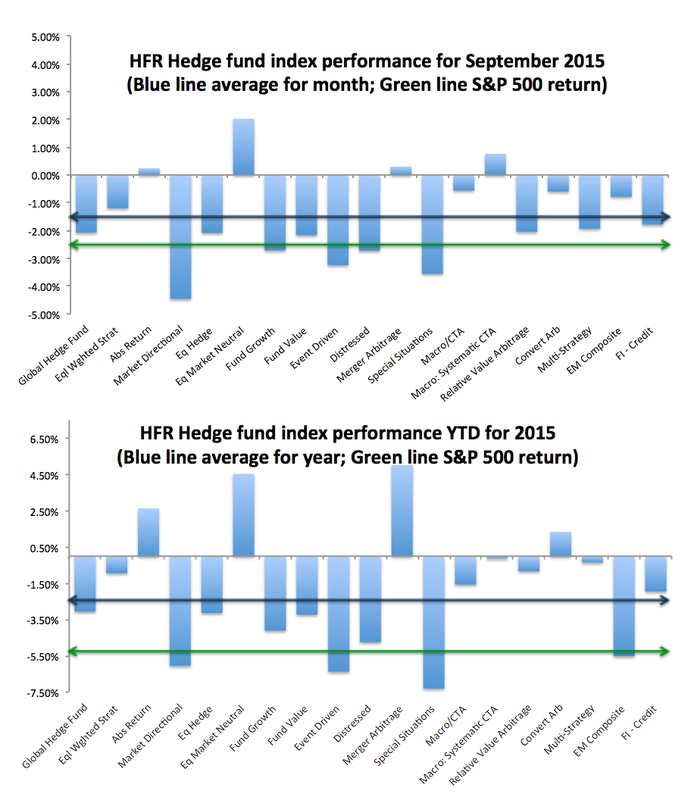 Only four strategies generated positive return across the major HFR hedge fund indices style benchmarks. 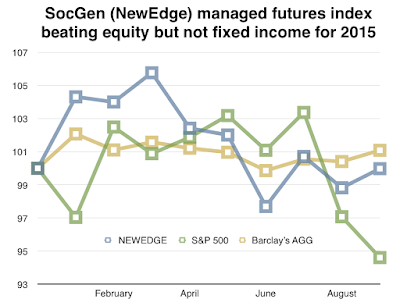 Managed futures, equity market neutral, absolute return, and merger arbitrage showed gains, but the average return across all strategies was -1.5 percent. The S&P 500 was down approximately 2.5 percent. Four strategies did worse than the stock index. There was nothing to be proud about this behavior, but there was diversification benefit from hedge funds. 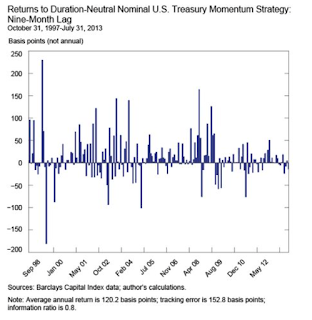 On a year to date basis, there has been greater return dispersion across strategies as should be expected. The S&P 500 was down 529 bps through the first three quarters, but hedge funds, on average, were down only 188 bps for the year. What is interesting is that event-driven and special situations underperformed versus the equity benchmark. Market directional and EM composite also showed poorer performance. One should expect that all of these strategies should provide more diversification versus holding a long-only stock basket. 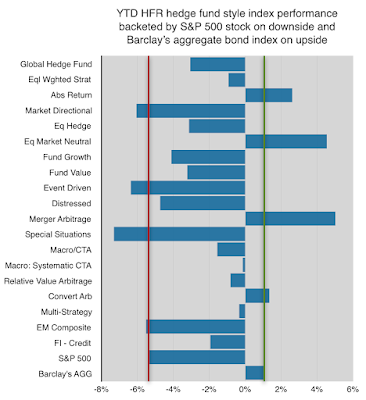 The market stand-outs include absolute return, absolute market neutral, and merger arbitrage. Merger opportunities in 2015 have been better on the back of cheap financing. Generally, merger arbitrage is highly correlated with the number of opportunities. The market neutral managers have down better with the increase in stock dispersion. 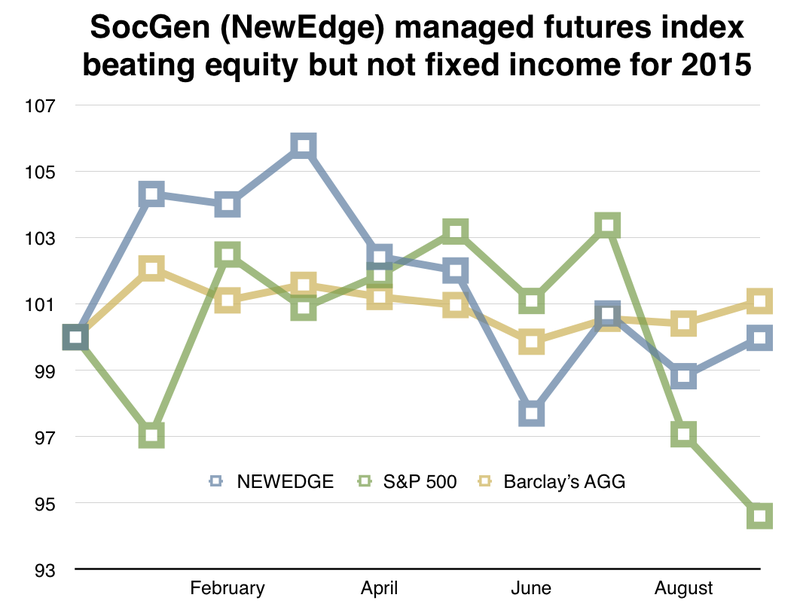 Overall, this has not been a good nine months for hedge funds. Expectations are for better absolute return and not stories of relative performance against poor stock returns. Nevertheless, there is strong return dispersion across styles. All hedge funds are not the same. The leading managed futures indices both showed gains in September. The Barclay BTOP 50, gained 1.74 percent for the month while the SocGen (NewEdge) CTA index rose 1.17 percent for September. Both moved to a flat return for the year to date with the BTOP 50 down 48 bps while the SocGen index is -2 bps for the year. Performance is mixed after hitting highs of 5 percent over the first four months of the year. We like to follow both indices given there different composition of managers. Performance has reversed with the increase in market uncertainty after the first quarter. This positive September return was after a strong negative August. This return profile was somewhat surprising given the volatility changes in September and the rangebound behavior for many markets. A closer look at the daily performance shows that loses accumulated for the first half of the month until the FOMC announcement. It was as if there were two separate parts for the month. 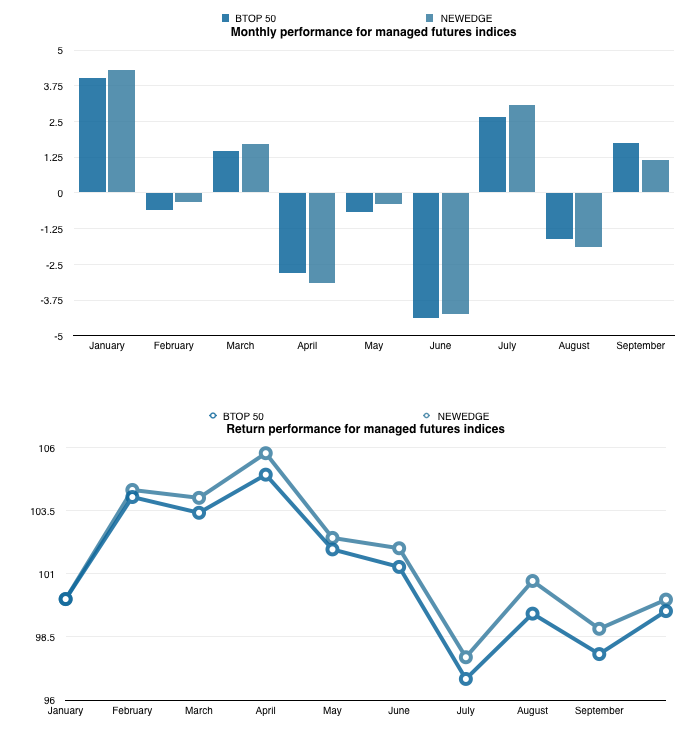 To get a feel for managed futures performance, we have presented the performance for the entire third quarter. There usually is a close association of performance across a two month period as positions from the prior month are carried over to the next month. It is hard to get a full picture of the attribution for returns for the indices, but we can look at the trend behavior over the quarter to get some indication of what were the drivers of performance. Stock indices - The sharp sell-off in late August and early September saw a bounce off of the lows with the dovish announcements of the Fed, but September was still a down month and a continuation the August sell-off. Longer-term CTA's were rewarded for holding positions. Bond and rates - Bonds actually rallied through August and September even with a sell-off with equities in late August and a quick reversal around the FOMC announcement. Longer-term traders were rewarded by holding long positions. Foreign exchange - Currencies more closely matched the behavior of stock indices with September dominated by chop. For example, the Euro saw little change over the month. The yen was range bound after as strong rally in August. The delay in Fed action has placed downward pressure on the dollar, but slower global growth is putting pressure on EM currencies. Energy - The strong down trend in WTI crude oil was arrested in late August, but there was little follow through in September. Any trading gains in energy were focused on short natural gas positions. Metals - Metals have still been dominated by China economic announcements. With firming of equities and mixed economic versus policy signals, there has been more market volatility. Commodities - Commodities showed mixed market movement with cattle and hogs rallying but other markets following the slowdown trend. Volatility was affected by the Fed announcement. When risk-off or risk-on behavior takes holding financial markets, there is a spill-over to commodities. While performance for managed futures is flat going into the fourth quarter, the increasing concern about economic growth will often lead to market dislocations and divergences. This type of environment should be good for managed futures if there are no attempts at market manipulation by governments. Target date 401K - Perfect place for hedge funds?